In this article we describe how using a visual, child-friendly measure of resilience in a randomised control trial (RCT), the Kgolo Mmogo (KM) project, resulted in representative insights on resilience in a mother-child relationship where the mother is HIV-positive. We used the existing psychological method Kinetic Family Drawing (KFD) to measure resilience of young children in the qualitative phase of the concurrent mixed method RCT as the children represent cultural groups for whom standardized measures have not been developed. We use the case example of baseline KM assessment data of 6 year olds (n = 11; 3 female, 8 male). The results of the study demonstrate that the visual and qualitative data from children (KFD) added to quantitative information obtained from mothers (Vineland Adaptive Behavior Scale, VABS). Additional information from the KFD had interpretation value for VABS scores and provided a child's perspective regarding resilience. Contrasting information from the KFD problematized mothers' perspectives as indicated in the VABS. The absence of significant information in KFD results regarding VABS sub-domains indicates differences in the cultural/contextual conceptualization of resilience. This exploratory study indicates initial support for the cross-cultural utility of the KFD to measure resilience in young children faced with adversity. In wellness studies more individualized conceptualizations of resilience have only been validated for a slight minority of the world's population, despite current literature speaking to more ecological definitions of the concept (Ungar, 2006). However, these validated measures are used in global studies, with implications for cross-cultural measurement. How do researchers measure resilience in psychology research when we work with participants beyond cultural dominant group s for whom measures have not been standardised? How do researchers demonstrate awareness of cultural variation and the potential for cultural bias in our selection of, use, analysis and interpretation of imported assessment tools (Carter, Lees, Murira, Gona, Neville & Newton, 2005)? Even more significantly, how do researchers measure resilience cross- culturally in young children when studies on resilience have indicated that culture modifies the ability of particular strengths to affect outcomes (Lightsey, 2006; Park & Huebner, 2005), thereby problematizing the cross-cultural conceptualization and operationalization of psychological resilience among young children. Kgolo Mmogo (KM) (Setswana meaning: 'growing together') is a 5-year randomized controlled intervention trial investigating resilience in HIV-infected mothers and their young children. In KM researchers faced measurement challenges (especially related to children's self-report resilience measures) as the team of cross-national researchers partnered with participants from cultures for whom existing measures have not been validated. Although the KFD is commonly used in South Africa as a psychological measure, its cross-cultural utility, specifically with regard to measuring resilience, has not been explored. Thus, assumptions were that, (a) the KFD could be a way to "reduce bias in traditional testing practices and utilize authentic and alternative assessment procedures" (Ortiz, 2002:1328), (b) through the KFD, young children would be able to draw/express their nested experiences of resilience in the mother-child relationship from an emic perspective, and (c) the KFD expressed emic experiences could be compared to scores derived from teachers' and parents' etic perspective Vineland Adaptive Behavior Scale (VABS) scores to examine utility. The aim of this article is to describe an exploratory study (as a subsection of the KM study) by taking a preliminary look at the extent to which the KFD, as a visual instrument with a child, can be used as an instrument for non-discriminatory assessment and contribute to an increase in understanding of child adaptive functioning. Objectives of this article are (i) to explore the extent to which the KFD (a validated measure) affords young children an opportunity to express resilience from an emic perspective; (ii) to compare resilience as measured with children in the KFD from an emic perspective with resilience as measured with mothers on the VABS from an etic perspective; and (iii) to explore the utility of the KFD as culturally appropriate measure of resilience in young children from an indigenization framework. The KFD is one of many drawing techniques classified as a performance measure of personality. Like other performance measures (Dana, 2007), the KFD instrument was primarily developed for English, Caucasian middle-class populations rather than for other cultural groups. 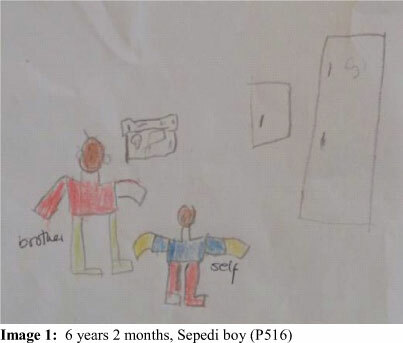 The KFD is an unstructured projective technique revealing a child's emotions in relation to individuals whom he/she regards as most significant and whose influence is most powerful in their lives (Madigan, Ladd & Goldberg, 2003; Hojnoski, Morrison, Matthews & Brown, 2006; Bekhit, Thomas & Jolley, 2005; Piperno, Di Biasi & Levi, 2007; Dunn, O'Connor & Levy, 2002; Fury, Carlson & Sroufe, 1997; Handler & Habenicht, 1994). The KFD can serve as a metaphor or symbol for what a child wishes to express at a specific point in time about a specific situation. The KFD has been used to measure resilience as reported by young children (Di Leo, 1983; Thomas & Jolley, 1998) within child-clinical psychology settings as a valid interview and assessment aid for children to express themselves. In developmental studies the KFD has been indicated as a valid index of children's thoughts, feelings and perspectives (Madigan et al., 2003). 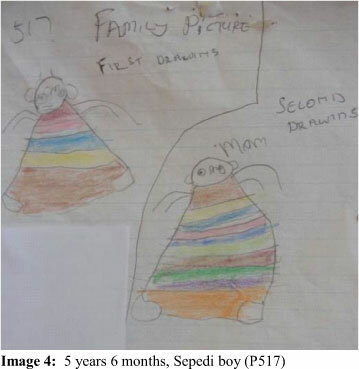 Similarly, Roe, Bridges, Dunn and O'Connor (2006) found that children's drawings observe pictorial principles and cultural rules of what defines a family although the authors also point out that the KFD has been criticized as a method to obtain information since the interpretation of drawings are open and establishing validity and reliability of data remains complicated. Regarding the use of KFD in research, various studies have used pictures to investigate interpersonal interactions and emotional relationships in family (Anning & Ring, 2004; Roe et al., 2006; Kortesluoma, Hentinen & Nikkonen, 2003; Skybo, Ryan-Wenger & Su, 2007). The KFD is viewed as non-threatening, as this known activity lessens children's anxiety and puts them at ease to express themselves. As some children have difficulty in verbalizing their feelings, drawing enables them to convey experiences. Psychology practices (assessment and therapeutic) are dominated by western psychological world views and epistemologies, particularly positivism. In terms of conceptualizing psychology, issues of individuality and materialism are often foregrounded, and understandings occur in terms of quantification and objectivity (Dalal & Misra, 2010). Within such conceptualizations of psychology, the scope for non-western perspectives in psychology has often been marginalized. Indigenization signals a move towards deconstructing psychology to no longer be decontextualized, but rather embrace cross-cultural, ethno, indigenous and cultural psychological approaches (McCubbin & McCubbin, 2005). In this way indigenization of psychology denotes 'indigenizing' the prevailing Euro-American discipline to be more culturally attuned, socially relevant and aligned with the ethos of individuals using the science. Psychological pluralism (Levers, 1997) contests western-psychology hegemony, but likewise opposes an 'either-or-stance' with western and non-western structured as dichotomies. Malott (2008) indicates how 'versus' stances dim discourses of challenges related to cultural differences within cultural groups. By implication, indigenization also indicates revised strategies of inquiry in science and scientific enterprise. Because of views that psychological engagement cannot be immune to cultural context, psychological research and practice have seen an increase of qualitative methods (relying on subjectivity, human experience and constructivist approaches to human understanding) (Dalal & Misra, 2010). Resilience (Luthar, 2003) indicates both processes that lead to well-being when individuals face significant adversity (such as HIV&AIDS in the specific population selected for this article), as well as outcomes associated with positive adaptation under stress (the latter of which is the focus in the VABS). Ungar (2006) and Seccombe (2002), however, offer a less individualistic focused, and more ecologically sensitive definition of resilience. Ungar (2006) in particular explains resilience as one's capacity to navigate their way to health-promoting resources, as well as the capacity of one's physical and social ecologies to provide resources meaningfully. Viewing resilience ecologically means that not only does a child require personal agency (adaptive functioning), but that family and community resources have to be available. Ecological views of resilience would also resonate with cross-cultural assessment approaches foregrounding situated cognition. An ecological definition also means that resilience can be considered from an emic (not only etic) perspective. In this regard resilience from an emic perspective (Brislin, Lonner & Thorndike, 1973) would strive for understandings of resilience from within a cultural frame from whence the concept becomes apparent. In contrast, an etic perspective on resilience would entail an evaluation of resilience as phenomena by assuming cultural neutrality or objectivity in the use of the concept of resilience across settings (Ungar, Liebenberg, Boothroyd, Kwong, Lee, Leblanc, Duque & Makhnach, 2008). Most scholars agree that insight into nuances of resilience is probably best rooted in designs embracing both emic and etic perspectives during measurement (Cheung, Cheung, Zhang, Leung, Leong & Yeh, 2008; Trickett & Birman, 2000). Although some scholars have been searching for decolonized ways to understand, portray and operationalize the plurality of well-being (Smith, 1999; Ungar, 2006), discourses regarding resilience are still dominated by perspectives of those outside western Eurocentric cultures. In this regard much has been written on ways in which children's experiences may be measured across cultures by adapting validated measures (Brandt, 2005; Butcher, 2004; Casillas & Robbins, 2005; Herdman, Fox-Rushby & Badia, 1997), as well as developing indigenous psychological measures (Adair, 1999; Adair, Puhan & Vohra, 1993; Carter et al., 2005; Condly, 2006; Ho, Peng, Lai & Chan, 2001). More and more, however, an emic perspective is supported as researchers recognize culture and context as meaningful during knowledge production. The presence of ecologies of knowledge in studies indicates scholars' increased awareness that existing understandings of positive development probably lack cultural and contextual complexity (Alegria, Vila, Woo, Canino, Takeuchi, Vera, Febo, Guarnaccia, Aguilar-Gaxiola & Shrout, 2004; Dawes & Donald, 2000; Elliott, Menard, Rankin, Elliott, Huizinga & Wilson, 2006). In the same way scholars have attempted to not only encapsulate international understandings of well-being amongst youth (Brown, Larson & Saraswathi, 2002; Carey & Ungar, 2007; Wong & Wong, 2006), but also to localize investigations regarding wellness in less studied settings (Donald, Dawes & Louw, 2000; Ebersöhn, 2008; Lee, 2005; Van Hoorn, Komlosi, Suchar & Samelson, 2000). In Kgolo Mmogo resilience is viewed from the perspective of adaptive behaviour, where the latter denotes the efficiency with which people achieve a level of individual independence, as well as social accountability (Perry & Factor, 1989; Sparrow, Cicchettim & Balla, 2005). The KM concurrent mixed method design incorporated various measures that were culturally adapted and translated prior to administration with mothers and teachers. In this paper we report on insights gleaned in KM from using the KFD and VABS. In KM the VABS measures resilience from an etic perspective, and the KFD measures resilience from an emic perspective. For cross-cultural assessment purposes (Van Widenfeldt, Treffers, De Beurs, Siebelink & Koudijs, 2005) both the VABS and KFD were translated into Sepedi, isiSotho, isiZulu and Setswana and the VABS was culturally adapted. Both the qualitative and quantitative measures were completed concurrently at the time of baseline assessment. The KM sample is characteristic of a South African urban sub-section of the population from Sepedi, isiSotho, isiZulu and Setswana groupings. For this phase of KM we made use of purposefully sampled baseline assessment data of young children (n = 11, 3 female, 8 male) between the ages of 5 years 6 months and 6 years 11 months. As KM specifically aimed to understand resilience where mothers' HIV-status is positive, participants were (i) children, namely HIV-negative children of mothers infected with HIV and involved in KM, and (ii) their HIV-positive mothers. Other data (VABS) for both the mother and child had to be completed and the KFD picture had to be clear and be accompanied by a transcribed interview with a research assistant. The child-participants were mostly in Grade 0 (Kindergarten), Grade 1 or Grade 2. As culturally sensitive approaches to research design posits indigenization (Dalal & Misra, 2010; Duncan, 2008), it was decided to include a visual method, the Kinetic Family Drawing (KFD) as a qualitative and emic way of measuring children's resilience from their perspective in the KM research design. The choice of the KFD aligns with notions that "young people's patterns of coping are embedded in the complex social ecologies of their families and communities" (Ungar et al., 2008:167). In this study we used the KFD as a visually-guided aid for interview (storytelling, narrative) with children to draw, talk about and interpret their experiences of resilience in terms of their family-context. 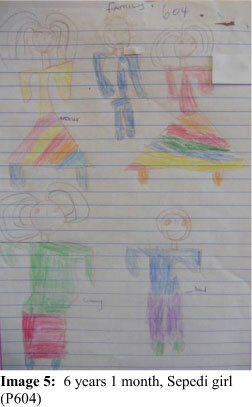 Research assistants instructed children (in their mother tongue) to "Draw your family doing something". 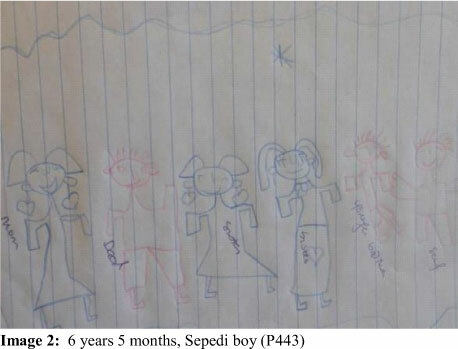 After the child had drawn the picture the research assistant asked the child to explain the picture by asking: "Who are the people in the picture? ", "What are they doing? ", "What did they do beforehand? ", "What will they do afterwards?" The interview was audio-recorded and verbatim transcriptions were translated prior to thematic analysis. Narrative analysis links with thematic apperception techniques, from a personological assessment paradigm, attending to the intra- and interpersonal processes underpinning personality development (Esquivel & Flanagan, 2007). Specifically we viewed the KFD data through Handler's (1996) lens as children's psychological images characteristic of themselves and demonstrated graphically "to represent self-in-the-world, or innate skills and strategies for daily living described by stylistic and symbolic representations" (Dana, 2007:236). Visual data were analysed by the researchers in terms of an integrated analysis framework based on Wegmann and Lusebrink (2000), as well as Klepsch and Logie (1982). 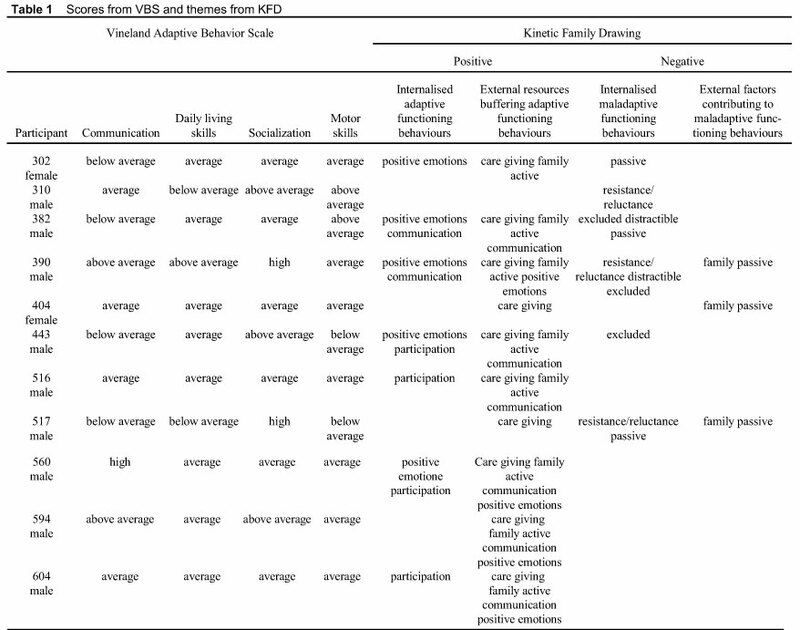 KM included the Vineland Adaptive Behavior Scale (VABS), Second Edition (Vineland-II) Survey Interview Form (Sparrow et al., 2005) to establish children's level of adaptive functioning behaviours from the mothers' perspective. In the VABS adaptive functioning behaviour is conceptualized as the execution of daily activities necessary for personal and social adequacy as defined by the expectations and standards of significant others (Sparrow et al., 2005). In addition, adaptive functioning behaviour is not viewed as constant, but as influenced by external and internal factors pertaining to a specific child's circumstances. As with the KFD, research assistants administered the VABS. Raw scores were compared to appropriate age norms to depict adaptive functioning behaviour in terms of four behaviour domains (each with sub-domains): communication, daily living skills, socialization, and motor skills. We compared results obtained with the VABS with results obtained with the KFD (Table 1). 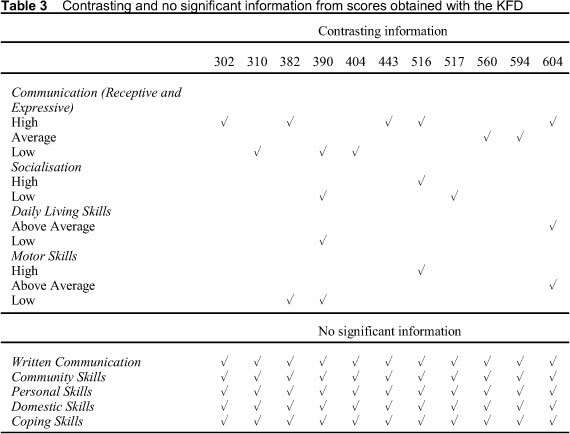 In addition we determined the extent to which KFD results provided additional, contrasting or no significant information as compared to VABS scores (Table 2 and Table 3). The results obtained with the KFD indicate adaptive functioning behaviours both within the child and external to the child (in the family environment) that serve as protective resources buffering the child's resilience. 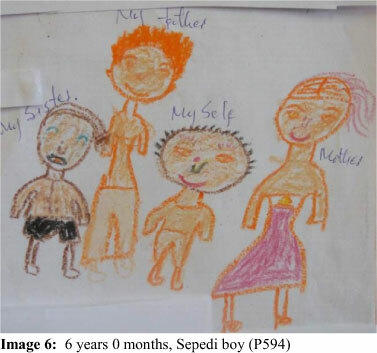 Images 1-6 indicate various child-participants' renditions of their families. We provide relevant extracts which emerged based on discussions of the drawings (as a probe for the drawing-directed child interview). "Ja, I like this sister." "She was helping my grandmother." 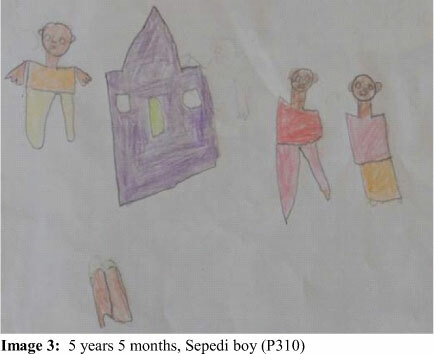 We provide the example of a five-year, six-month old Sepedi girl, Lerato (a pseudonym), to show the utility of the KFD-instrument to increase understanding of child adaptive functioning. Based on the VABS scores we know that Lerato's strengths are similar to the rest of the group in terms of using language to gather and provide information, interacting and using time constructively. Different to the rest of the group, she is exceptional in household chores (VABS items include: is careful around the stove or an open fire; helps prepare foods that require mixing and cooking (pap, cakes); helps with simple household chores like dusting, picking up clothes or toys, sweeps, mops, or vacuums floors). Lerato also shares growth areas with the rest of the group. As with other children in the sample, Lerato needs to develop a sense of responsibility and sensitivity, and the ability to use money and the telephone. In comparison to the rest of the group, the VABS scores suggest that Lerato is one of the children who still needs to develop skills to listen and understand, to learn to eat and dress independently, and grow in her motor skills (ability to use her arms and legs). From the KFD we observe various protective resources buffering Lerato's resilience. Regarding her family, she thinks her family meets her physical needs and she has a close relationship with her father. Accordingly she views her family as a place of comfort and belonging. Intra-personally Lerato experiences positive emotions. In the KFD risk factors are also present and serve as barriers to Lerato's resilience. In this regard Lerato experiences the family as inactive, and disengaged from one another. Lerato expresses distance between herself and her mother. The drawing also indicates limited spatial organization. Based on both measures it would seem that young Lerato lives in a family where the close bond with her father, as well as the fulfilment of her physical/material needs, means that she feels integrated into a comforting family. Accordingly both her father and the family at large are protective resources buffering her resilience. As reported by her mother, Lerato's resilience is demonstrated by a higher score than her peers for household chores, and (like her peers) excellent interactive skills and outstanding time-management. These intra-personal skills also indicate protective resources. On the other hand, the distance Lerato indicated on the KFD between herself and her mother is a risk factor plausibly signalling a barrier to her resilience. 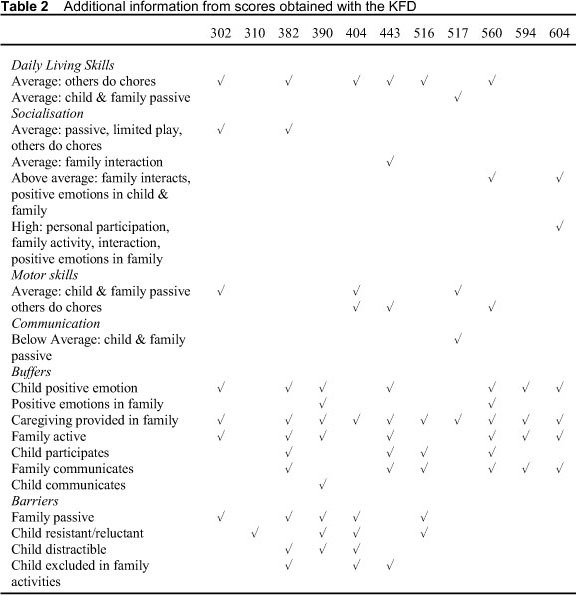 The mother-child distance may be either a cause or a result of general passiveness in the household - family members individually and collectively appear to be more sedentary. This family-system passivity may compound risk by limiting productive opportunities to develop gross motor skills and personal dressing and eating skills. The fact that Lerato is exceptional in household chores could possibly mediate the otherwise placid energy-levels in the household. Although she excels in speaking, Lerato struggles to listen and understand, po ssibly presenting one explanation for the reported need to develop sensitivity and responsibility. Results obtained with the KFD can be used to further interpret scores obtained with the VABS. Children's responses with the KFD clarified mothers' perspectives of their children's adaptive functioning behaviours. As in other studies (Anning & Ring, 2004; Burns, 1982; Dunn et al., 2002) visual data provided additional information including vignettes of buffers and barriers on the subject of children's resilience (Fury et al., 1997). Results obtained with the KFD support findings from other investigations (Roe et al., 2006; Klepsch & Logie, 1982; Handler & Habenicht, 1994) that children draw and talk about culturally familiar and age-appropriate behaviours, also as related to adaptation. Space- and person-specific images support the notion that indigenous psychological measures render suitable cultural data (Adair, 1999). Also, from their frame of reference, children provided contextually relevant data of what adaptive functioning behaviours constitute. Therefore the results from the KFD enriched the scores obtained from the VABS. Additional information from the KFD also provides hypotheses for some causes of (mal-)adaptive functioning behaviours. As an example we associate children's limited personal, domestic and motor skills (VABS) with the high incidence of family-members (not children) performing household chores and providing for children's basic needs. Contextually, it seems that children were not required to engage in tasks where they could have acquired related adaptive behaviours. The possibility exists that culturally/contextually personal and domestic skills may not be viewed as relevant adaptive tasks for this age group. Besides the absence of written communication, results from the KFD also submitted no significant information on certain VABS sub-domains. 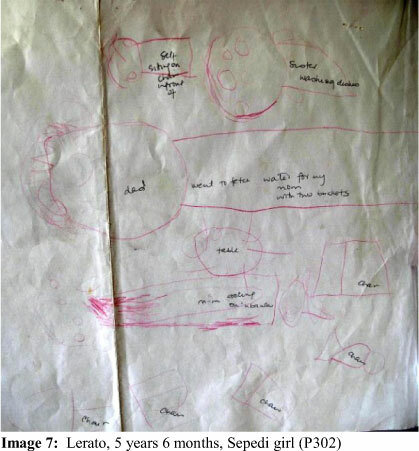 The absence of telephones and money (indicated as Community Skills in the VABS) in both pictures and narrations could indicate the absence or insignificance of these objects in the life-worlds of children-participants, or could be a result of the prompt ('Draw your family doing something'). Results obtained with the VABS indicated that mothers perceived the majority of children to have limited responsibility and sensitivity (coping skills). Correspondingly children did not express coping skills on the KFD. Although two incidences occur where personal (443) and domestic skills (604) appear in results from the KFD, these sub-domains are on the whole absent in data from the KFD. The absence of these themes could indicate that community, coping, personal and domestic skills may not be perceived as age appropriate adaptive functioning behaviour in the relevant cultural groups. This supposition echoes assertions in other studies (Brandt, 2005; Casillas & Robbins, 2005; Ho et al., 2001) that translating existing measures may not suffice for cross-cultural use. Rather, these same authors argue for culturally adapting existing measures. We infer that culturally tailoring related items in the VABS may contribute to measuring adaptive behaviours in comparable South African groups. There are some clear limitations to the study. We report on a small sample of children of several cultural groupings within one township in one African country of whom their mothers are HIV-positive (facing a specific, highly stigmatized adversity). Thus generalization to other similar cultural groupings is risky. We therefore recommend replication of findings with other groups to determine the utility of the KFD to explore children's emic-perspectives of resilience. At the heart of this article lies the notion that research needs to be culturally relevant, meaning an indigenization of praxis. Using the KFD as a visual method provided rich information of adaptive functioning behaviours in children. The KFD, as a child-completed instrument, added to our understanding of resilience in this group of children by providing supplementary information enriching understandings of scores obtained with the VABS. Themes that emerged from analysing the KFD presented possible causes of adaptive and maladaptive functioning behaviours as identified by their mothers. The drawings and narrations obtained with the KFD foregrounded protective resources buffering resilience in the sample of children. Conversely, the visuals and narrations also indicated risk factors causing stumbling blocks for resilience in children. Contrasting results from the VABS and KFD pose questions, amongst others the suitability of translating the VABS for use in similar South African groups. Consequently, instead of translating existing measures for cross-cultural use, differences in the conceptualization of adaptive functioning behaviours may call for either developing indigenous psychological measures of resilience, or culturally tailoring (indigenization) the VABS for use in similar South African groups.